There are lots of good reasons to have indoor plants, even plants in the bathroom. They are beautiful, uplifting to look at and be around and they serve a practical purpose in keeping your home environment clean and healthy. Houseplants improve the air quality in your home by cleaning the toxins from the air. While it’s advisable to have houseplants in every room, it is especially good to have them in the bathroom. Even if your bathroom is dark and windowless, and even if you are a terrible plant keeper, you can have success by keeping the right plants in your bathroom. In this article, we will present the best plants for bathrooms that do well even in a low-light bathroom setting. We will also provide advice on caring for and displaying your bathroom plants perfectly. Read on to learn how! Can Plants Live Without Light In The Bathroom? The short answer to this question is “No!” All plants must conduct photosynthesis (the transformation of light to energy) to survive and thrive; however, some plants need less light than others to do this. Therefore, success with any bathroom plant begins with choosing the right plants. You can approach this process from several different perspectives. Choose plants that naturally grow in low light. Understory plants hailing from rain forest settings do quite well in the high humidity, lowly lit environment common to many bathrooms. Air plants (bromeliads) and some succulents can also do well in these circumstances. Use a grow-light and/or overhead fluorescent lighting to add needed light to your bathroom and expand your choices. Rotate plants in and out of your bathroom to give them turns at a sunny window elsewhere. Throw your hands in the air and purchase silk or plastic plants. This is also a dreadful option as you will reap no air purifier benefits from having artificial plants in your home and the manufacture of these impostors is very bad for the environment in general. Carefully choosing live plants and providing them with proper lighting as needed is the best way to go. Luckily, there are lots of suitable plants to choose from. Under-story rainforest plants, bromeliads, epiphytes and even some succulents do very well in low light and humid environment. Is It Expensive To Use Artificial Light? I have not found any plants that need no light. Providing your bathroom plants with artificial grow lights for plants is one of your options. The lighting is affordable and can benefit you, as well as your plants. You can replace the bulbs in your bathroom with full-spectrum bulbs for just a little more than you would pay for regular light bulbs. Full spectrum bulbs allow you to enjoy a better quality of natural light in your bathroom. Exposure to full-spectrum lighting is a proven mood elevator and is prescribed as a treatment for Seasonal Affective Disorder (SAD) which causes wintertime depression. Use these bulbs in your overhead light fixture. You can also get full-spectrum CFL grow light bulbs at a quite affordable cost. It’s not a good idea to put these bulbs in your overhead socket for a couple of reasons. First, flipping them on and off causes them to wear out quickly. Second, it‘s best to have these bulbs close to your plants for superior results. You can use these convenient bulbs in any lamp to place them close to your plants to provide bright light directly to the plant and create an attractive grow space for your bathroom plants. Use these bulbs to provide natural, bright light to your plants. Keeping a grow light bulb or two burning continuously is quite inexpensive (pennies a day) and the benefits you reap from having healthy plants thriving in your bathroom more than justifies the expense. If your bathroom is truly windowless or very dark, keeping a source of full spectrum light burning will also make the room more comfortable and inviting for you and your guests. You may also be happy to know that almost all the plants that do well in a bathroom setting reproduce with rather wild abandon when well-kept. If you take good care of your bathroom garden by giving it ample artificial light and the recommended occasional watering, you will be able to give your friends living plants on almost every gift-giving occasion! Think of the money you’ll save! For bromeliads and epiphytes, overhead full-spectrum lighting left on for about 12 hours a day may be enough. For plants with a greater need for light, place a grow light bulb in an attractive lamp or light fixture placed close to the plant and make your lighting part of the décor. You can leave your grow-light burning continuously or set a timer like this Fitnate to limit it to 12 hours daily. Use of a time will make management of your light automatic so you won’t have to be bothered with it. For your comfort, you probably keep the temperature in your bathroom fairly consistent. The general rule of thumb for most house plants is if you are comfortable your plant probably is too. If your current habit is to keep your bathroom cold except when you plan to take a bath or shower, you’ll need to alter that if you want to keep plants happy. Keeping a small heater running on a low temperature setting (or programming your smart thermostat to keep your bathroom at a comfortable temperature) is beneficial to you and your plants. Humidity levels in the bathroom naturally vary quite a bit. The humidity will rise quickly and briefly whenever you take a shower. Luckily, this is very good for many tropical plants, bromeliads and some succulents in terrariums. In some instances, you may need to provide a little more humidity by misting your plants. What Are The Best Bathroom Plants To Choose? Choices in plants that will do well with low lighting, consistently comfortable temperature and reliable levels of humidity abound. Here are some of the best choices in succulents, bromeliads, epiphytes and tropical plants to brighten your bathroom décor. An inexpensive and easy to find at garden centers, grocery stores, dollar stores, convenience stores, car washes and gas stations and many other venues. It is easy to grow and enjoys a low-light setting. You don’t even need soil to grow the lucky bamboo plant – Dracaena sanderiana. Just purchase a few shoots, take it home and pop it into a container of pebbles or marbles and filtered water (or water that has been allowed to sit out overnight to allow chemicals to dissipate). Change the water weekly to prevent mold growth. This type of plant grows very quickly, but you can keep it the size you want by trimming it regularly or by placing it in an area that hampers its growth. For example, you might put a shelf above it. True ferns such as Bird Nest, Boston fern (Nephrolepis exaltata) and Staghorn ferns do very well in low-light bathroom settings. Another is the “asparagus fern” not a true fern but its look has earned it the name. They like indirect, natural light so a window is desirable but a full spectrum grow light will also work. Ferns will enjoy the humidity from your showers, but they also need regular watering and misting. Remember to check the soil and keep it lightly moist (not soggy) at all times. Aspidistra elatior – the cast iron plant is an excellent choice if you are a notorious plant killer. This plant likes a low light setting and can tolerate a neglected watering schedule. It can tolerate extremes of temperature (50-85 degrees Fahrenheit). Naturally, as with all living things, a consistent temperature is appreciated. To take good care of aspidistra, place it in an area with indirect sunlight and water it thoroughly when the soil becomes bone dry. Wipe the long, spear-like leaves with a damp cloth from time-to-time to keep them dust-free. If your bathroom is windowless, provide artificial light. This attractive plant comes in both dwarf (18 inches) and full-size (2-3 feet high) varieties. Leaves may be dark green, yellow striped or dotted with yellow. The Aglaonema is a lush, leafy plant with large leaves variegated with white or pink markings. You will often see this plant in a mall or office settings because it is tough and beautiful and it loves a controlled indoor environment. It is a tropical plant, and your bathroom is the perfect place for it! 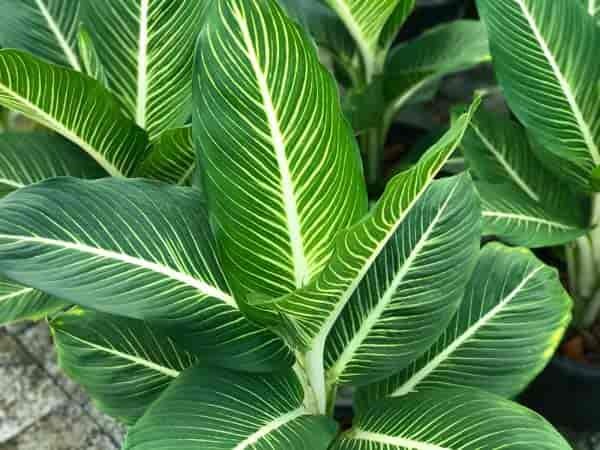 The “Dumb Cane” is similar in appearance to Chinese Evergreen and Cast Iron plant, but it much bigger. Its leaves can grow to be a foot long or more. Dieffenbachia prefers artificial light and needs bright artificial lighting to thrive. It needs protection from direct sunlight. It also likes high humidity and consistently moist well-drained soil. If you have the unusual circumstance of having a large, windowless bathroom and you want to create the illusion of a well-lit, tropical setting, this plant will do well for you. The “Dragon Plant” comes in more than forty varieties. It’s long, spear-like leaves range in width from very fine and thin to a couple of inches wide. Available in solid green, greenish-maroon, and variegated colorations. The leaves emerge from relatively thick, trunk-like stems. This plant is a real workhorse when it comes to air purifying. It prefers artificial light to natural light and will scorch in bright sunlight. This low-care plant does very well with just the high humidity levels you would expect to find in a bathroom. The “philo” comes in many shapes and size. Large and small, medium-light, low care tropical plants with glossy green, variegated and even maroon colored leaves. The split-leaf variety sometimes known as Monstera. Heartleaf philodendron with its heart-shaped leaf is a long-time, popular favorite. All types of philodendron prefer consistent, moderate lighting, so artificial lighting is the best choice. They also need a consistently warm temperature, so plan to keep your bathroom between 75 to 85 degrees Fahrenheit. Sansevieria (aka: Snake Plant or Viper’s Bowstring Hemp) is a very familiar standby. This tough customer grows in tall, upright, rigid spears of dark green with darker green striping and white or yellow edges. It is a NASA star in terms of an air purifier, and it tolerates all manner of abuse. This plant will do well in light levels ranging from low to bright indirect lighting. It will also do very well with fluorescent or grow lights. It is fine in most humidity levels and needs infrequent watering. A favorite plant for bathroom settings. Zamioculcas zamiifolia – Known also as the Eternity Plant or ZEE ZEE Plant – is a sturdy South African plant that can tolerate a wide variety of conditions. It does not like direct sunlight or very deep shade, but if you can provide any level of indirect light or artificial light, it will be happy. ZZ is a drought tolerant plant, but it will do best if you water it thoroughly when the top inch of the soil becomes dry. If you do forget and it begins to drop leaves, give it a good watering, and it is sure to bounce back. ZZ has thick, glossy, dark green leaves that grow on long fronds. It is a very attractive plant that attains a maximum height of two feet. The Peperomia plant with about 1,000 species has been popular as a small houseplant for decades. With all the species available only a handful are grown commercially. One of the most popular species with many sports and cultivars is Peperomia obtusifolia. Sometimes called the baby rubber plant, Peperomias make nice additions to a bathroom. Peperomia plant care is easy. They like humidity, withstand lower light levels, and don’t like over-watering. You’ll find many small varieties perfect for bathroom use. All but one of these choices in upright, low-light plants are practically indestructible. Ferns can be a bit delicate, so if you want a truly carefree plant, you may wish to avoid them. #1 Ivy of all types do an incredible job of air purification. In fact, NASA rated ivies among the top plants for helping keep ambient air free of bacteria and mold. The English Ivy plant with its many leaf forms and the durable grape ivy (Cissus) are two of the hardiest and most common types of ivies grown as a houseplant. Many different types of ivy do very well in hanging baskets or trailing from a high shelf or windowsill in a bathroom setting. The choices in leaf shapes, shades and coloration are nearly endless. These plants do well with moderate natural light or with artificial light. #2 – Spider Plant (chlorophytum comosum) also gets a high score from NASA when it comes to cleaning the air. This sturdy, attractive little plant has been found to remove approximately ninety percent of formaldehyde from the ambient air. Spider plants are available in both an attractive solid green and a light green color with yellow stripes. Their leaves are long and spear-shaped, and they send out runners upon which baby spider plants grow if the plant is getting enough light. These plants can do well in low light; however, they will not send out runners with too little light. To thrive, moderate-to-bright indirect light levels are preferable. This plant will do well at normal bathroom humidity levels. Water thoroughly when the top one-inch of soil feels dry. #3 – Pothos (aka: Devil Ivy or Epipremnum aureum) is a familiar, ivy-like plant available in a variety of leaf colors from bright, solid green to attractively variegated yellow and green. This rugged plant grows quickly and abundantly from cuttings, and everyone has seen it growing in schoolrooms, on kitchen windowsills, and in other humble settings. The bathroom is the ideal setting for Pothos. It loves low lighting, ample humidity, and a relatively stable temperature. It can be pruned to make a bushy plant or hung in a basket or set on a high shelf for a rampant, trailing effect. Although the five plants shown in this charming video are not billed as bathroom plants, they do all appear on our lists. These lovely, showy plants come in a wide variety of blossom colors and types. Their fleshy, semi-succulent leaves are also attractive and come in several shapes, sizes, and shades. Orchids are inarguably elegant and shockingly easy to care for. If you have been wondering “Where should I put my orchid?” look no further than your bathroom. Orchids like indirect sunlight or artificial light. They need protection from bright, direct sunlight. Because they appreciate higher humidity levels, these compact beauties are a perfect choice beside your sink or on the side of your tub. Keeping phalaenopsis orchids in a bathroom is easy. The Peace Lily plant is another very beautiful and elegant looking plant that sports glossy leaves and lovely white blooms. This plant is also a top NASA pick in terms of filtering out chemicals (i.e. formaldehyde, trichloroethylene, benzene) in the environment. Peace lilies are relatively large, so they make good candidates for floor planters. They like indirect sunlight or artificial light. Daily misting is recommended. For this reason, they do need ample humidity and/or daily misting. Orchids and Staghorn Ferns are epiphytes. Other examples include Spanish Moss and jungle cactus, such as Mistletoe Cactus (Rhipsalis) which does very well kept in a terrarium setting. Drunkard’s Bones (Hatiora salicornioides) is related to Mistletoe Cactus and is also a good candidate for a countertop terrarium or hanging like this, ventilated glass globe. This compact plant provides a great deal of visual interest. Most bromeliad plants and epiphytes are compact (except Spanish moss, which tends to trail and drape enthusiastically). Small bromeliad plants can be used in a wide variety of artistic ways in a bathroom setting. They are very good for wall mounted frames or open, hanging terrariums. There are thousands of species of bromeliad and epiphytes, and most would be good candidates for a small low light or windowless bathroom equipped with fluorescent lights, full spectrum lights and/or grow lights. These equatorial plants are happy with about 12 hours of filtered light daily and a consistent temperature of about 65 degrees Fahrenheit. Try making a bromeliad garden for long-term, easy care color all year round. #1 – Aloe Vera is an excellent plant to have in any home. It is attractive and useful. The gel contained in its spears possesses tremendous healing qualities and can be used as a salve on bug bites, minor cuts and bruises, sunburn and more. There are several different varieties of this plant, so you can create a varied display using aloe exclusively. All varieties do well in a low light setting that provides a consistent temperature. Aloe’s water needs are so low that it may do well just getting its water from the humidity in the air. Keep an eye on it, though. If it begins to look withered, give it a drink. #2 – Haworthia is a South African genus of low-light succulent plants that contains over seventy species. Most of these plants are compact, and easy to grow in a low light setting. They require little water and are ideal candidates for terrarium growth in a humid environment with limited space. Like aloe plants, these succulents may do well simply gleaning their water from humid bathroom air. The choices in both aloes and haworthia are many and varied. You may wish to make a focused collection of these two types of carefree, low-light succulent plants. How you position your bathroom plants depends on the layout of the room. If you have a window, it’s good to locate your plants near it or on the windowsill. If not, other good places include tub-side, on the countertop beside the sink and on the toilet tank. Plants (especially Lucky Bamboo) on the back of the toilet and strategically placed in a “money corner” are believed to attract wealth and prevent squandered resources and loss of money. If you are strapped for space, hanging bathroom plants are always nice. This is especially true if you have a skylight. It is also possible to mount plants in a wall frame to save space and create a stunning visual effect. If you have a small bathroom and/or an expanse of wall you would like to decorate, ferns, bromeliads, epiphytes and succulents do well in frames. You can light your framed plants as you would a work of art with a grow light bulb placed in an attractive lamp above (and perhaps below) the frame. On a grander scale, you can cover an entire wall with plants by purchasing a pre-built living wall installation or studying do-it-yourself plans and tutorials to build your own. Here is a video featuring the Grovert Living Wall Planter, which makes this project very easy to accomplish. The plants used in this video would do well with bright indirect sunlight or ample artificial light. You can accommodate almost any space by placing plants that can thrive in water in attractive vases around your bathroom. Ivy, pothos and lucky bamboo are examples of plants that can live well in filtered water and pebbles indefinitely. If you have little or no floor or counter space, hanging baskets are perfect for ivy, spider plant, pothos and other trailing plants. Bromeliads do very well in special, ventilated glass globes designed just for them. For most bathroom-friendly plants you can use traditional planters and pots with well-drained soil. A large planter set in your “money corner” or a perfectly sized planter for the back of your toilet can make a very attractive addition to your bathroom. Outfit it with a grow light in a decorative fixture for even more appeal. Line small potted plants along a windowsill or the side of your tub. If you have a sink on a pedestal or simply attached to the wall with no cabinet, you have a perfect place to keep tall, upright plants such as Mother-in-Law’s Tongue. Place them artfully below your sink to camouflage pipes and add a touch of living beauty. A bathroom setting that receives indirect natural light from a window would be ideal for this treatment. You could also set a standing lamp equipped with a grow light beside your sink to provide your under-sink plants with indirect light and yourself with natural light for shaving or applying makeup. Even a tiny, dark bathroom that is little more than a “water-closet” can become attractive, inviting and healthier by adding living plants. While plants do require light to live, there are many plants that actually prefer low light or artificial light. Refer to the information presented here to select the right plants for your bathroom environment and set them up in an attractive and healthy home where they can thrive.